Tim Stancill came home from a visit to see Don Jagger in Ohio. He brought me a rolling chassis of a 125 Rickman Zundapp – the motor mounts had been cut off, other brackets were cobbed on – I have no idea what motor they were for! So what to do? I really didn’t need another project but a couple of months later, I was talking to Karl Heise and he thought a 4-speed OSSA engine might fit well in that chassis. It did! 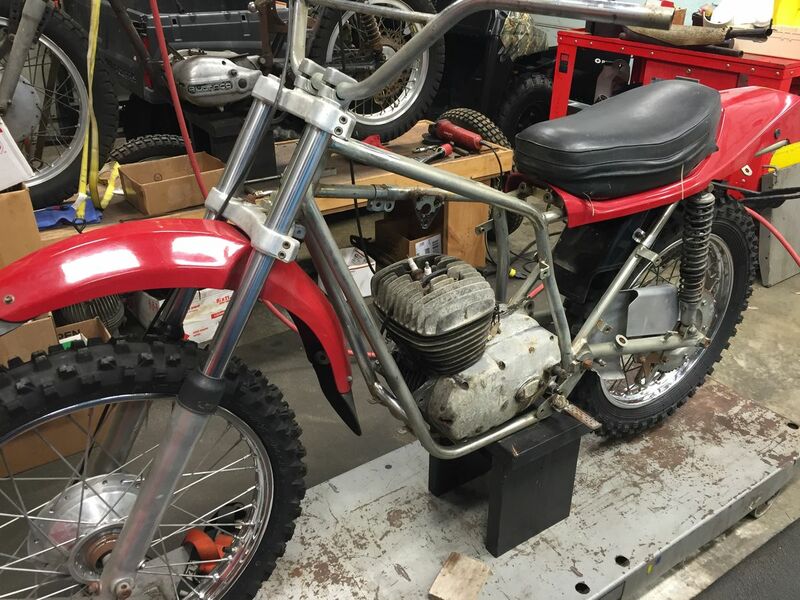 We used mounts from a bent 74 Desert Phantom frame, centered the motor, changed the rear wheel so the sprocket and brake were on the right side and just by luck, the chain lined up pretty well. I already had a Mikuni carburetor conversion and we had adapted a Phantom pipe from Circle F. We did have to modify the rear frame loop for the Mx tail section, Allen Brown supplied the side panels. The orange color was inspired by some of the Rickman road bike kits, similar to what they would supply for a Honda 750 model. A lot of people ask if Rickman supplied a frame for the OSSA powerplant – the answer is no, but we got one! Thanks for the project, Tim.